Ireland Rugby International player, Brian O'Driscoll, pictured here with Comedian and rugby supporter, Hector Ó hEochagáin launching the O2's "Be The Difference" rugby campaign. 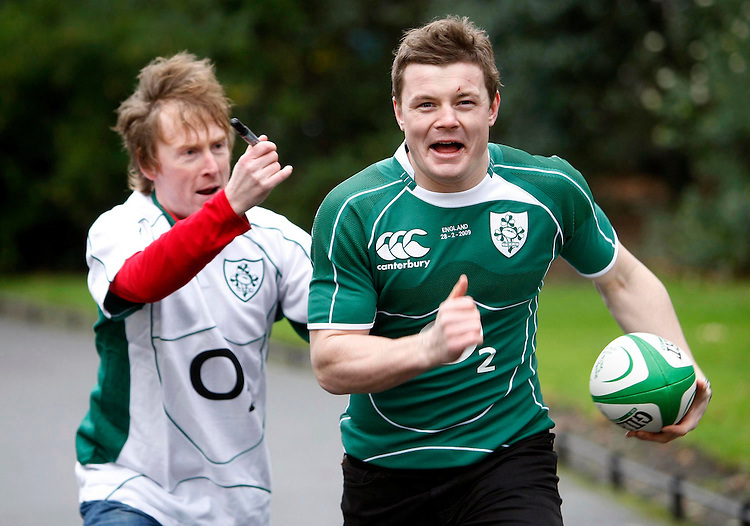 The campaign is giving loyal Irish rugby fans the chance to be on the field with the Irish rugby team during the match against England at Croke Park on February 28th. 'Be The Difference' is all about the difference that fans' support can make. So now thousands of lucky fans can show their support by having their names printed onto the number on the Irish rugby players' match jerseys during this crucial clash..To find out more about being the difference for the Irish rugby team during the upcoming Six Nations tournament, log on to www.bethedifference.ie or visit any O2 store nationwide. Pic. Robbie Reynolds..